Have you ever felt like the word love just wasn’t enough to describe all the many ways love can manifest? “I love you” applies to a spouse, a child, parents, friends, pets, a beautiful sunrise, a favorite author, and even ourselves. But the exact emotions behind each of these expressions of love are quite different. Anthropologist Franz Boas was the first European to point out that Eskimos had 50 words for snow (though his initial estimate was a bit off the mark). The Sami peoples of Scandinavia have upwards of 1,000 words for reindeer. It’s clear that for these groups, in their environment and culture, it’s essential to have plenty of ways to describe what is most important. The Sami peoples of Scandinavia have upwards of 1,000 words for reindeer. It’s clear that for these groups, in their environment and culture, it’s essential to have plenty of ways to describe what is most important. So why is it that today, we only have one word to describe the intricate and complex emotions that make up love? In the time of the ancient Greek philosophers, there were seven commonly understood types of love. Taking the time to familiarize ourselves with these ancient definitions now can help us not only understand ourselves better but can help us get clear about our expectations when it comes to loves complexities. Understanding loves hues will also help us to feel connected to others and to all of humanity. And of course, as the angels say, to keep choosing love in every moment. Below is an introduction to the seven types of love that Greek philosophers defined. The Greeks used Eros to describe sexual attraction toward others. Eros is sexual desire in its purest form, and is really the closest thing to modern romantic love that the Greeks defined. Eros is both intense, consuming, and yet also quick to fade. Relationships built only on this form of love do not tend to last, which provides immense insight into the many short-lived relationships in our society that glamorizes Eros. The word erotica comes from Eros and the Greeks had a healthy wariness towards it. They seemed to understand this could get them in trouble. Eros is characterized by a loss of control, of ‘falling,’ and sometimes poor judgment. It was not without its practical uses though, as the Greeks generally felt Eros was the primary impulse behind procreation. Connected to the Root and Sacral Chakras. Philia is used for the love you feel for friends and family. It is connected to companionship, trust, and friendship and most often exists when values are shared and feelings are mutually reciprocated. When you feel closely connected to someone after having gone through a difficult time with him or her, this is Philia. The Greeks considered Philia to be love among equals and therefore valued it above Eros. It is free from physical attraction and has more to do with loyalty or a sense of team. Plato (for whom platonic love gets its name) felt that Philia was the highest form of love, but his student Aristotle disagreed. Aristotle felt that the friendship between lovers was the highest form of love. Philia born from Eros is strong. It transforms lust into a shared reaching for higher understanding of the self, each other, and humanity. If you are able to combine Philia with Eros, there is a strong chance of achieving a long-lasting relationship (but you also need the Philautia form of love described below). The ancient Greeks viewed Philia as a kind of therapeutic relationship – love between people who are open, insightful, and striving to change. True friendship that inspires a desire for truth, fullness, and authenticity. Connected to the Heart Chakra. 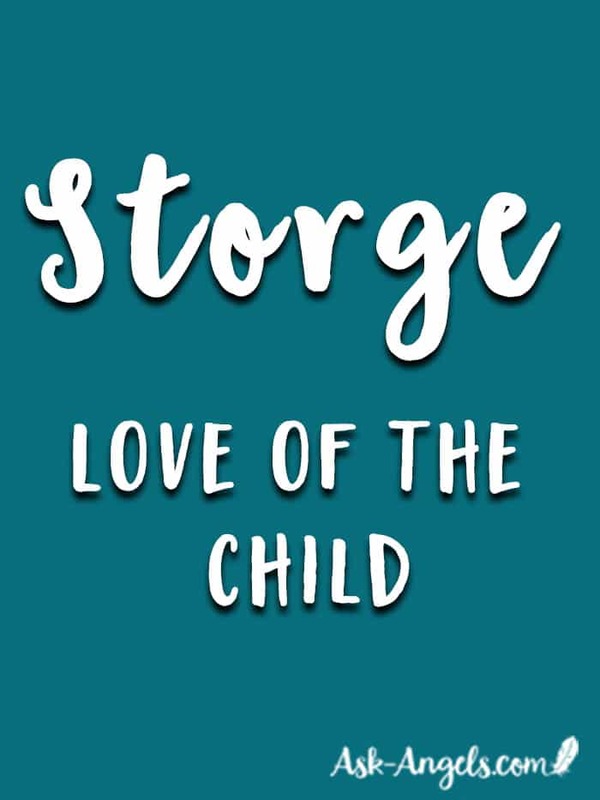 Storge is the effortless love that parents have for their children. It is characterized by acceptance, forgiveness, and sacrifice. Through this love, children come to understand comfort, nurturing, security, and safety. Storge is similar to Philia in that there is no physical attraction, but Storge is reserved for family. The Greeks did make an exception in finding Storge among childhood friends who grow into adulthood together. As you can imagine, this is a very powerful form of love, and because of this, it can create obstacles in our lives. When our closest family members don’t align with our values or spiritual path, we can feel incredibly conflicted. We crave that support and understanding and have a great deal of difficulty moving away from it – if that becomes necessary. Storge is born out of dependency and isn’t based on our personalities (like Philia and Eros). When adults expect Storge in their relationships, resentment and/or co-dependency can develop. This is universal love. Agape is what we feel for humanity, Mother Earth, and the Divine. We tap into Agape most easily through meditation, time in nature, and following our intuition while walking our spiritual path. This is the main type of love the angels speak of when they encourage us to keep choosing love in every moment. 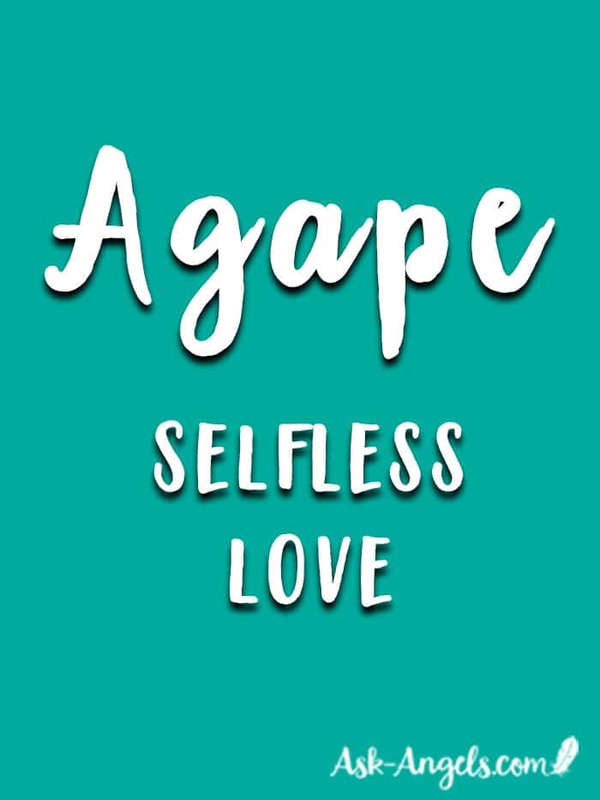 You can think of Agape as altruism, charity, and unselfish concern for others. It is acting in alignment with the highest interest of all. Agape is the glue that binds us socially, psychologically, and environmentally. You could argue that modern cultures indicate a current lack of Agape worldwide. Agape is given without expectation of anything in return. The Greeks considered it the highest form of love. It is bigger than our individual selves, free from desire and expectations, and exists despite shortcomings. Agape is connected to all seven major chakras. It is the love that connects us to All That Is. Playful love is known as Ludus. Think seduction, flirtation, and sexual experiences without attachment or commitment. The focus of Ludus is in the experience, not so much the attraction itself (like Eros). Ludus can also relate to the love shared among participants of playful experiences like sport or games. Connected to the Sacral Chakra. You’ll find Pragma with couples who have been together many years. It has had time to age and develop over time. Pragma has transcended the casual and moved beyond the physical. There is an easy harmony and balance here. 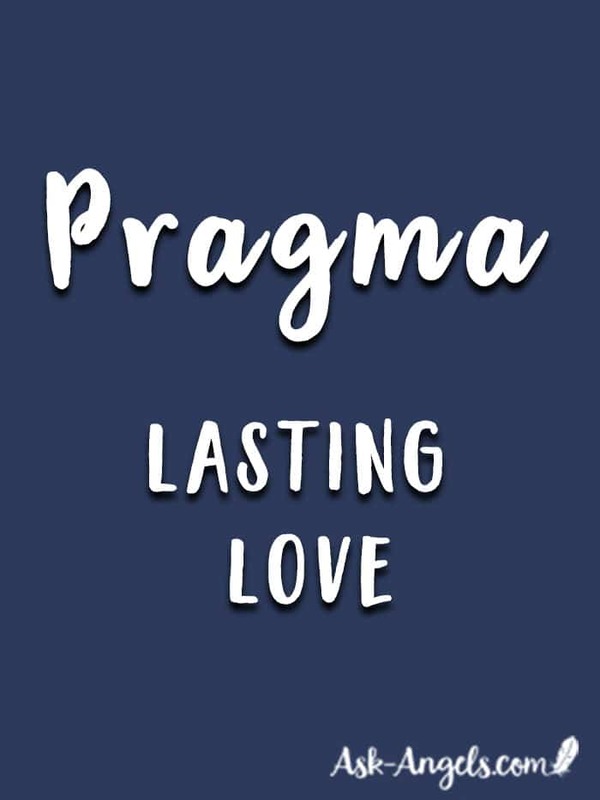 Pragma is a rare type of love in our societies today. Our culture puts emphasis on finding love, not on maintaining and nurturing it. Unlike Storge, Pragma requires effort from both parties. It is the art of learning compromise, developing patience, and being tolerant. This type of love requires a profound understanding between people and a great deal of time. Connected to the Root and Heart Chakras. Our sense of belonging and purpose come from Philautia. It is the self-love and self-worth needed to believe in ourselves so that we can walk our spiritual path. Philautia can be either healthy or unhealthy. The unhealthy variety is connected to hubris and narcissism. It focuses on fame, wealth, and pleasure. 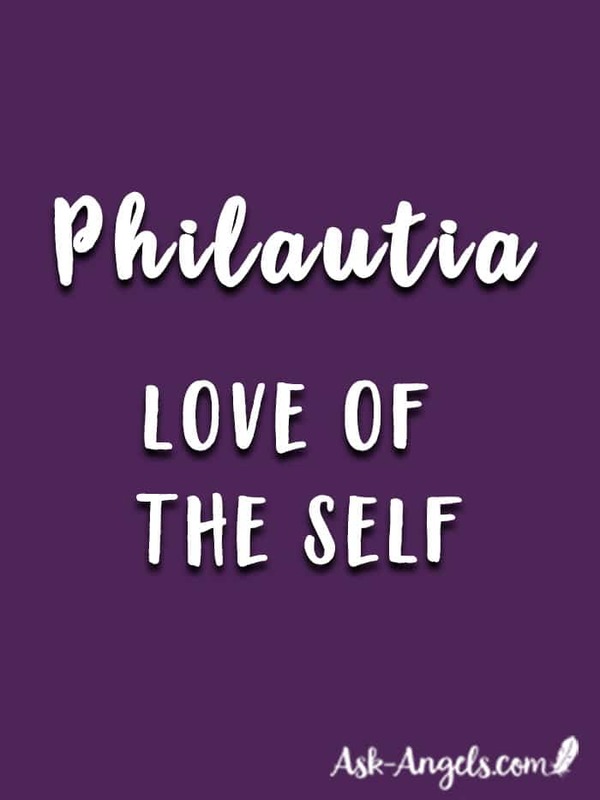 The healthy form of Philautia teaches us that we must learn to love ourselves first in order to truly love others; nor can we care for each other before we learn to do that for ourselves. The Buddhist philosophy of self-compassion is a great example of Philautia. Once you have developed a deep sense of comfort within yourself, you become a beacon of love for others. The Greeks believed that the only way to true happiness was to learn unconditional love for yourself. It is the most direct way to experience spiritual freedom in this life. Connected to the Heart and Third Eye Chakras. Love is not complicated, but it is complex. We all long for love, are made of love, thrive on love, and will risk much to give and receive it. 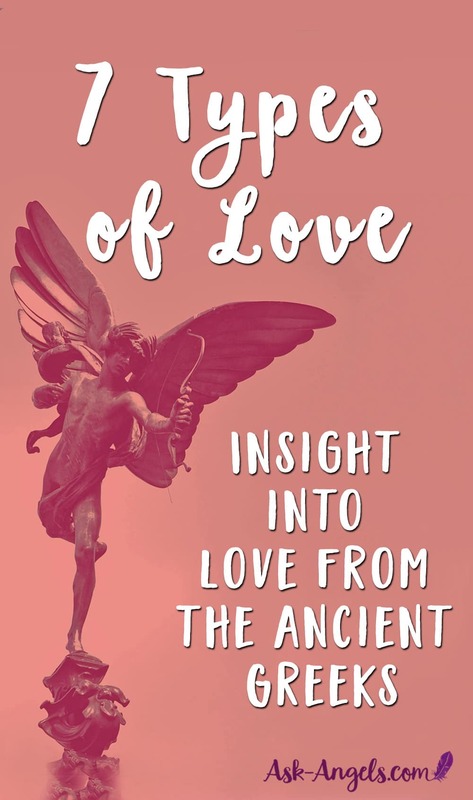 Defining love, knowing how it’s different forms interact with each other and manifest in our lives is vitally important to our spiritual health. Return to a state of coherence by quickly realigning with Divine Love here! Learn how to Send Light and Love!